Providing you the best range of ratna religious decorated pooja thali, decorated pooja thali, meenakari pooja thali and hand crafted pooja thali with effective & timely delivery. Having been engaged in manufacturing, exporting and supplying a range of fine paintings, we are presenting an exclusive collection of Religious Thali. 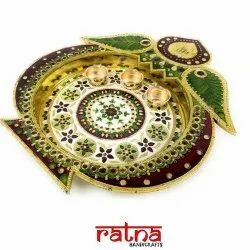 Our offered thali is designed with utmost accuracy and is widely used to decor of interiors. This thali has secured a wide space in Indian households. The offered range is renowned for its clarity and fine quality. 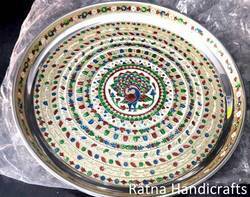 We are well known manufacturer of decorative thali. These thali also known as puja thali , wedding thali, decoration thali, wedding phokhana thali, navratari thali, decorative metal thali, aarti thal, pooja thal, puja thal, owernachi thali, hawan pooja thal, aarti thali, diwali puja thali etc. 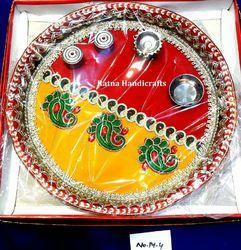 We make these aarti thali in many different sizes and shapes , different colours and shades. Our decorative thali are very decorative and looks very rich and attractive, our aarti thali are also used in diwali for pooja and archana of lord laxmi mata, we make special aarti thali for diwali, we make special packing for diwali , we make diwali hampers, our packing and gifting items are used in many corporate gifting orders by many corporate gifting companies. 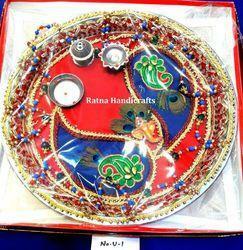 Hand crafted Pooja Thali for religious purpose, gifting, decoration, diwali, pooja, aarti, marriage. The piece has fine hand work on fine quality base.